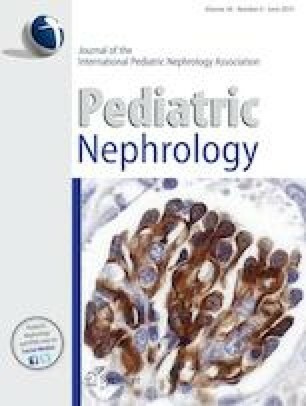 Optimal treatment of Henoch-Schönlein purpura nephritis (HSN) remains unclear. We evaluated outcome of pediatric HSN patients treated initially with either methylprednisolone (MP) or cyclosporine A (CyA) in Finland between 1996 and 2011. Outcome of 62 HSN patients was evaluated by screening urine and blood samples (n = 51) or by collecting clinical parameters from medical charts until last follow-up visit (n = 11). Sixty (97%) patients had nephrotic-range proteinuria and/or ISKDC grade ≥ III before initial treatment. Patients were initially treated with either MP pulses (n = 42) followed by oral prednisone or with CyA (n = 20). Fifty-nine (95%) patients received angiotensin-converting enzyme inhibitors and/or angiotensin receptor blockers. Mean follow-up time was 10.8 years (range 3.2–21.2 years). One patient developed end-stage renal disease and another had decreased renal function (eGFR < 60 mL/min/1.73m2), both initially treated with MP (3%). Six patients (5 MP, 1 CyA) had eGFR between 60 and 89 mL/min/1.73m2 (10%). Eighteen patients (13 MP, 5 CyA) had proteinuria and/or hematuria (29%) and four of them had proteinuria > 0.5 g/day at end of follow-up. Sixteen (38%) MP-treated and two (10%) CyA-treated patients needed additional immunosuppressive treatment (RR 3.81, 95% CI 1.16–14.3, p = 0.035). Late initiation of treatment was associated with an increased risk for persistent proteinuria. Long-term outcome was relatively good in both treatment groups. However, since urinary abnormalities may persist or develop, long-term follow-up of HSN patients is mandatory. Early initiation of treatment had a favorable effect on proteinuria. The online version of this article ( https://doi.org/10.1007/s00467-019-04238-2) contains supplementary material, which is available to authorized users. We would like to thank Mrs. Anna Vuolteenaho for language editing. This work was supported by a grant to M.K. from the Finnish Kidney Foundation, the Päivikki and Sakari Sohlberg Foundation, the Foundation for Paediatric Research, the Paulo Foundation, and the Alma and K.A. Snellman Foundation, Oulu, Finland. Informed consent was obtained from all patients (and their guardians if necessary) who participated in the follow-up screening. The study was approved by the ethics committee of Helsinki University Hospital. All procedures performed in studies involving human participants were in accordance with the ethical standards of the institutional and/or national research committee and with the 1964 Helsinki declaration and its later amendments or comparable ethical standards.